Here's what we'll be eating on Thanksgiving. 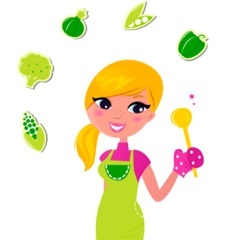 Some of the recipes are mine, and some are recipes I've collected over the years. I have a few pictures of some of the dishes from last year, but will post the rest after Thanksgiving. Hope you all have a wonderful and delicious Thanksgiving! I found this recipe on foodnetwork.com and thought it sounded amazing. This will be our first course. If you are serving this to your little one too, serve it without the toppings. Preheat oven to 350F. Cut up sweet potatoes and put in a large pot of water over med high heat. Boil sweet potatoes until tender. Drain, remove skins and mash. Stir in butter, maple syrup, salt, pepper, sage, cinnamon, and nutmeg. 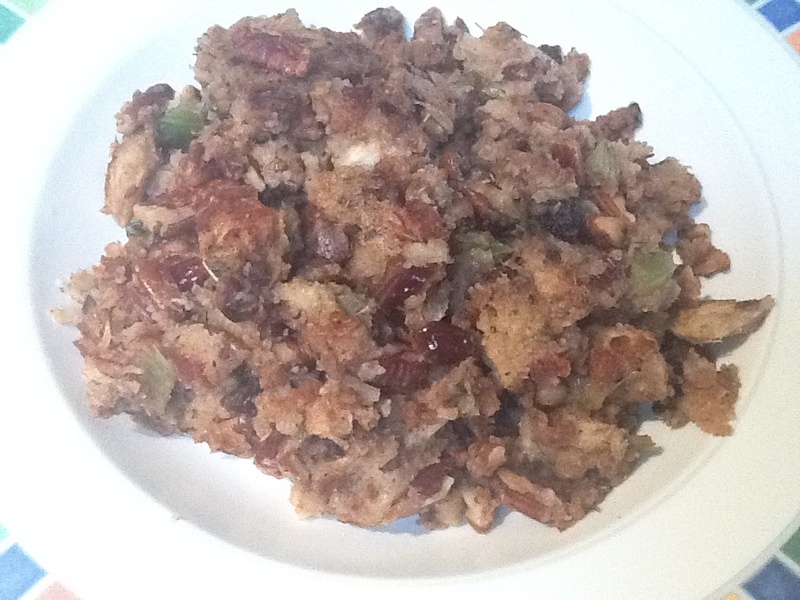 Pour sweet potato mixture into a deep baking/casserole dish and top with chopped pecans. Place in oven and bake for 30 minutes. Preheat oven to 350F. Spray baking dish with olive oil. Place halved brussels sprouts around dish. Add shallots. Season with salt, pepper, and Italian seasoning. Spray generously with olive oil spray. Add pancetta. Place in oven and roast for 30 to 40 minutes. Boil potatoes in a large pot until tender and then drain. Remove peels and mash. Stir in milk and season with salt, pepper, garlic powder and herbs de provence. Mix until smooth. This is the good old recipe that you can find on the back of any cream of mushroom soup or fried onion pieces container. Preheat oven to 375F. Spray a baking dish with cooking spray. Add green beans. Cover with mushroom soup. Add milk, salt, pepper, and nutmeg. Toss to coat. Cover with 3/4 cup fried onion pieces. Place in oven and bake for 15 to 20 minutes. Add rest of onion pieces before serving. I came up with this recipe last weekend, and tested it out for the first time today. 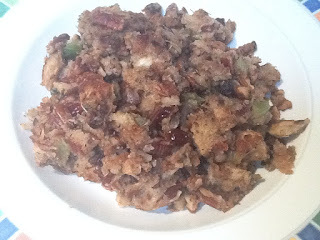 Not to toot my own horn, but my husband said it was the best stuffing he'd ever had! Hope you enjoy it! Add 1 tblsp olive oil and 2 tblsp butter to a large saute pan, over medium heat. Add onions, celery and garlic. Season with salt and pepper and saute until tender. Add dates, pecans, and Herbs de Provence and toss. Cook for another few minutes. Toss and then remove from heat. Add the diced bread and toss together. Pour in the chicken stock and knead with your hands until the bread is very moist. Season with salt if needed. Transfer to a large deep ovenproof dish and bake until it is hot all the way through and crusty on top. This is a Paula Dean recipe that I'm trying for the first time this year. I'll let you know how they are. This is my mom's recipe. She makes this cranberry sauce every year. It's tart and refreshing. Peel and seed orange, save the peel. Put cranberries, orange, orange peel, and sugar in a food processor and blend until finely chopped. Serve and enjoy!